A group of citizens from Debagoiena held a press conference on February 16 in front of the Community of Debagoiena with the slogan “Landfill no!”. Among people who took part were members of Zero Waste Gipuzkoa (Zero Zabor). They emphasized that Debagoiena is separately collecting 80% of their waste, while the rest of the municipalities reach under 50% separate collection, this is why they have underlined that they will start speaking about “solidarity” when “others start to be responsible”. They will not accept receiving mixed waste in Debagoiena and they demand Debagoiena municipality refuses the landfill project in Epele. Their aim is to create a regional proponent to work in order to fulfil these goals. 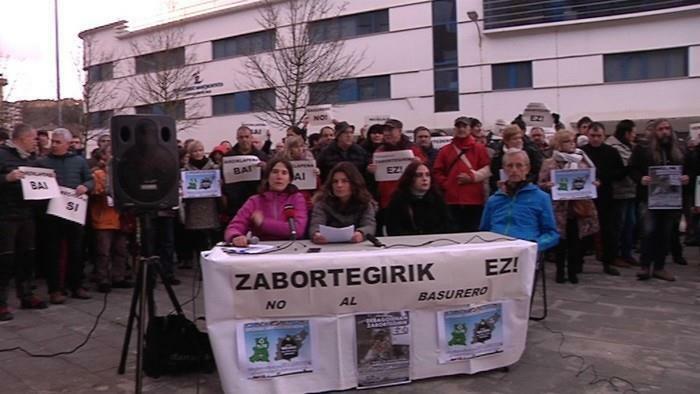 “Most of the waste which is not recycled or composted in Gipuzkoa is going to be thrown without any treatment in Debagoiena. 100,000 tons of mixed waste will be brought to our region, while within Debagoiena we are generating only 5,000 tons of waste. The solution is not to build an expensive and polluting infrastructure, the example of Debagoiena is a role model for a healthy solution. Our region is doing things well, important organisations have congratulated us and we have become a reference point in Europe because we have recycled 78% of our waste. But we haven’t got this results out of respect for the environment.